I am totally obsessed with anti-aging products right now. I’ve getting more and more fine lines under my eyes so I’m really conscious about trying to prevent them from spreading to the rest of my face. Today I have a few brand new anti-aging products to share with you, including four new serums and two new moisturizers. Serums are my favourite part of my skincare routine because you can mix and match your serum to target certain concern areas. Moisturizers are also fun to use because it helps to seal off your serum underneath, and applying that moisturizer can also be a very therapeutic experience as you press and massage the product into your skin. 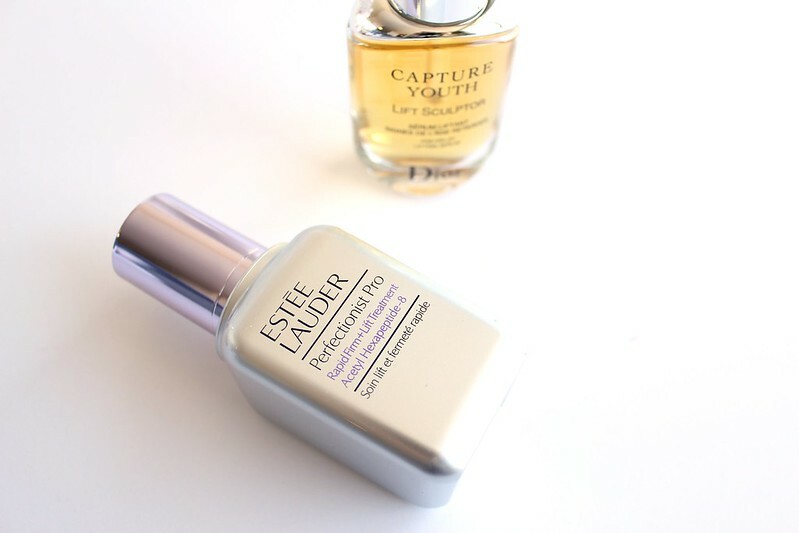 The Estee Lauder Perfectionist Pro Rapid Firm + Lift Treatment (C$100 for 30mL) is a patented serum from Estee Lauder that targets your entire face – lifting and firming the jawline, cheeks, and laugh lines. It contains AHAs to help exfoliate your skin, as well as an exclusive peptide Acetyl Hexapeptide-8 that helps to boost the skin’s collagen and elastin production. It has a very light fluid milky gel texture that absorbs really quickly and will immediately smooth the look of fine lines on the skin’s surface. It does have some silicones in its ingredients list, so that it has that immediate smoothing effect. In addition, it contains some ingredients that give you an immediate “glow,” i.e. subtle shimmers, so I’ve been enjoying this more-so during the day than at night. I really like this serum for its smoothing effect. I have also noticed a bit of firming around my jawline. That being said, I don’t particularly enjoy silicones in my skincare, especially at the serum step, because I find that other products don’t penetrate my skin as well. If you have combination or oily skin, I can actually see this as being a great moisturizer / last step before sunscreen. It is lightly hydrating and is a great option for a daytime summer hydrator for those who don’t need as much hydration. You can pick up Estee Lauder products at The Bay and Holt Renfrew. 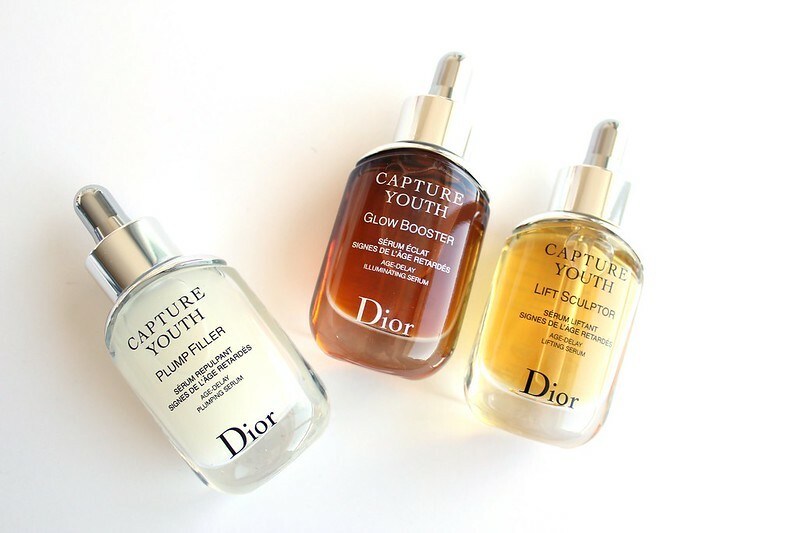 The Dior Capture Youth Lift Sculptor Age-Delay Lifting Serum (C$120 for 30mL) is one of five serums newly released with the new Capture Youth collection. You can use the Capture Youth Serums alone as a serum, mixed in with the Capture Youth moisturizer, or create your own serum cocktail by mixing and matching with other serums from the line. The three that I have are the Plump Filler, Glow Booster, and Lift Sculptor. The Lift Sculptor is rich in polyphenols derived from tea. The Lift Sculptor feels kind of like a liquid honey in my hands. It is lightweight but still rich. It feels slightly smoothing but I haven’t felt any obvious lifting. The Plump Filler is a good-ish hyaluronic acid serum. It does its job, albeit with a bit of a silicone-y feel. For a hyaluronic acid serum, it is a bit on the pricey side so I’m not sure I would recommend it. There are many good hyaluronic acid serums on the market that won’t break the bank. That being said, if you are planning to create your own serum cocktail, it may be better to stick with the Capture Youth version because they have been formulated to complement each other. The Glow Booster is pretty amazing – it’s very lightweight and fluid, almost like an essence serum. It soaks into my skin so quickly and doesn’t cause irritation, despite it being an exfoliating serum. I only use this at night, and it feels amazing layered underneath either the Plump Filler or the Lift Sculptor. The other two serums are Matte Maximizer, a mattifying serum; and Redness Soother, a neutralizing serum for those with skin redness. I actually have quite a bit of redness in my cheeks so I would be interested in trying that one. The Matte Maximizer would be amazing for those with oily skin, or if you are going on vacation in the summer and don’t want to touch up your skincare! You can pick up Dior products from The Bay and Holt Renfrew. Clarins Extra-Firming is one of the world’s top selling anti-aging moisturizers; three creams are sold every minute around the world! For Spring 2018, Clarins has reformulated this cult classic with the addition of the kangaroo flower, a groundbreaking ingredient that increase the skin’s regeneration capacity. The goal is skin that resists stretching, resists pressure, and bounces back into shape. It comes in Day and Night Creams, each in two formulations – for all skin types or for very dry skin types. You can see below the different textures applied on the back of my hand, from top to bottom: day cream for all skin types, day cream for dry skin, night cream for dry skin, and then night cream for all skin types. The night cream for dry skin is incredibly nourishing and super rich, perfect for when you have heating or air conditioning on at night and need something that packs an extra punch. I have the “all skin types” version and they work very well for me in this warmer climate. 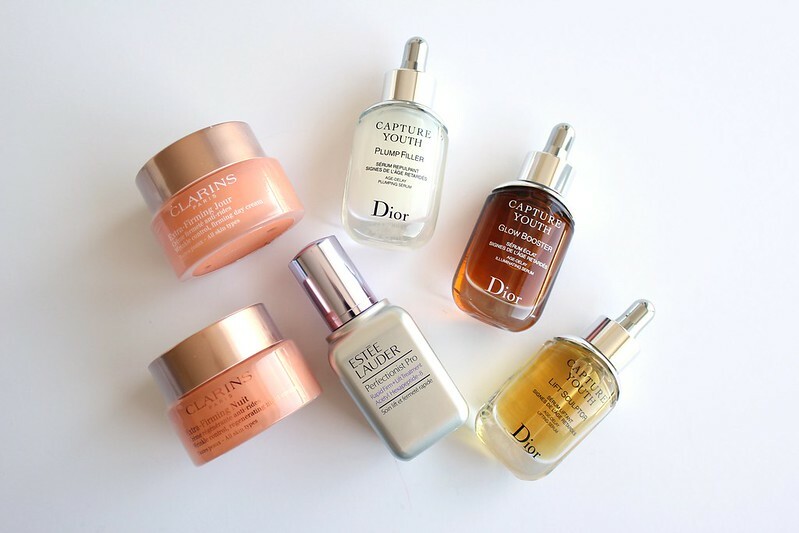 I layer these over a serum, such as one of the Dior Capture Youth Serum, and it gives my skin an amazing boost of hydration and lifting. My feels feels and looks glowy and more plump. 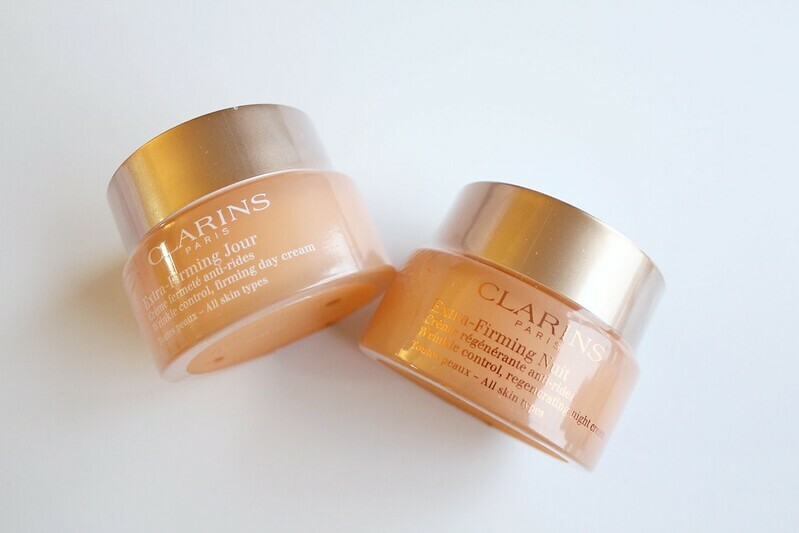 I don’t think you necessarily have to purchase both the day and night versions, but of course if you are looking to give your skincare routine an overhaul, Clarins Extra-Firming could be a good option. Of the two, I prefer the Night Cream better in terms of texture because I do love thicker creams. You can pick up Clarins Extra-Firming products at The Bay and Sephora. Product provided by PR for review consideration; all opinions are my own. Sheila is a Vancouver, Canada-based beauty, lifestyle, and fashion blogger, since 2008. See here to learn more about Sheila and her blog, Maddy Loves. Questions/comments? Sponsorships/invitations? Contact me at maddylovesblog@gmail.com. Look forward to hearing from you! All of the products featured on Maddy Loves are products that I have tried for myself over a period of time. They may be working for me, but may not work for you. Please exercise discretion when making your purchasing decisions. Maddy Loves will not be held liable for any problems or concerns that arise. Unless otherwise stated, the products featured on Maddy Loves were provided by brands or PR for editorial consideration. Maddy Loves is not affiliated with any of the brands, companies or products unless otherwise specified. All of the opinions on Maddy Loves are solely my own and do not reflect the opinions of the brands or companies. 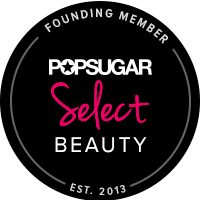 Maddy Loves is an unbiased beauty blog and its opinion or conclusion are not influenced by whether the product was purchased or provided as a media sample. Please make note that any content on this blog is copyrighted to me (unless otherwise stated). Please do not reproduce without permission.